You are at:Home»Baby»Temp-N-Toss Disposable Thermometers: Versatile AND Affordable! 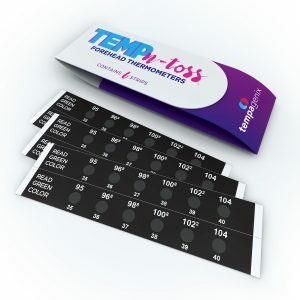 Temp-N-Toss Disposable Thermometers: Versatile AND Affordable! I have been completely won over by Temp-N-Toss disposable thermometers. I never expected so much from a little piece of sticky paper, but these little things have honestly made my life so much easier. I’m a big fan of simplicity and these thermometers are about as simple as it gets. Whether you’re a new mom, a mom with four kids, a nurse or just a regular person, everybody can benefit from these thermometers. They work wonderfully on anybody of any age, but they’re especially perfect for small children and babies. With Temp-N-Toss disposable thermometers, there is no more hassling with battery operated thermometers. No more rummaging through your bathroom cabinets in the middle of the night, no more dead batteries, no more searching for those weird, little button batteries at the store. 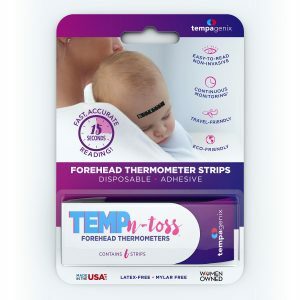 Temp-N-Toss disposable thermometers allow you to simply peel and stick to the child’s forehead. You’ll receive an accurate reading in only seconds. You can also leave them on for continuous monitoring. 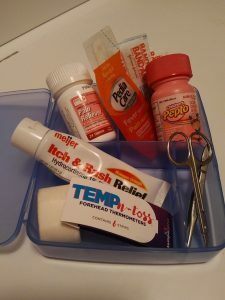 Temp-N-Toss are also perfect for any first aid or nurse’s kit. I’ve given packages to a few of my nurse friends and they absolutely love them. They’re convenient, fast and reliable space savers for any kit. They’re allergy friendly because they’re latex and mylar free. And because they don’t require any glass, mercury, or batteries, they’re very eco-friendly. 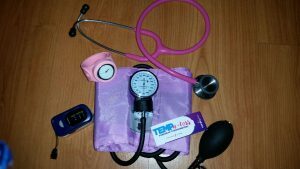 Temp-N-Toss thermometers are perfect for purses, diaper bags, medicine cabinets, first aid kits, nursing kits, travel bags and make great additions to baby shower gifts. I’ll probably always have a regular thermometer in my house as a back up, but I will continue to use Temp-N-Toss thermometers on a regular basis. Temp-N-Toss disposable thermometers are available online at Walmart. Grab a few today. You’ll thank yourself later! Every Baby Needs Temp-N-Toss Disposable Thermometers! Give Bunnies by the Bay Gift Sets This Holiday Season! Give your baby the comfort he or she needs with the Boppy® Baby Chair! Good Natured Gourmet Our Love Collection & Romance Cookie Mix! Well this is brilliant! Such a smart idea. They are so great to just keep everywhere, too!! What an awesome idea! I can not tell you how many battles I have fought when having to wake a sick child who was (finally) peacefully sleeping just to take their temperature. I need this so badly for my 4 year old. He does not like to stay still even when he is feeling bad. I remember using these when I was younger. They are so cool and smart to keep with you on the go! I’ve never heard of these! I would love these for when my little ones aren’t feeling well, but don’t want to sit still for an ear thermometer. Thanks for the heads up!